^ The method for designating the year was changed in 2008 to reflect that the person was TOY for the upcoming year instead of the previous year. 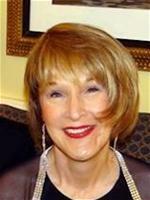 Rae Ellen McKee - National Teacher of the Year in 1991 is shown left in 2013 while attending the Teacher of the Year Gala at the White House to honor the 2013 teacher honorees from each state. 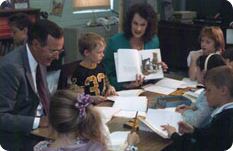 On the right is Rae Ellen in 1991 with some of her students at Slanesville Elementary with then President, George H. W. Bush, in attendance. * Other Finalists for West Virginia Teacher of the Year from Hampshire County were: Linda Staub (1989), Sue Alkire (2002-03), Isaac Lewis (2011-12), Paul Roomsburg (2012-13), Brenda Omps (2014-15), Shelby Walburn (2015-16) and Teresa Thorne (2017-18).